In a memorandum of understanding, Frankfurt Main Finance e.V. (FMF) and Casablanca Finance City (CFC) agreed on a long-term cooperation. 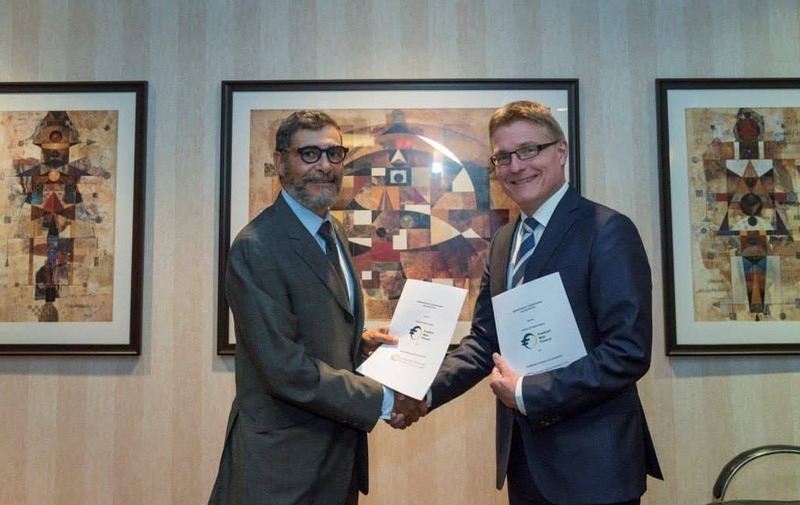 Hubertus Väth, Managing Director of Frankfurt Main Finance and Said Ibrahimi, CEO of Casablanca Finance City Authority, signed the MOU on 11th of June 2018 at the Conference of Montreal. The agreement focuses on current issues facing the financial industry such as sustainable finance and FinTech industry. Moreover, the partnership emphasizes the commitment of both financial centres to promote business opportunities in their respective economic regions, namely the Eurozone and Africa. It will also reinforce the efforts from both sides to attract financial institutions, holding companies, multinationals and service providers to Frankfurt and Casablanca. Additionally, the agreement aims to foster the development of an effective cooperation via joint programs, financial trainings, research activities, workshops, publications and study trips. Mr. Said Ibrahimi, CEO of Casablanca Finance City, stated: “We are delighted to sign today this memorandum of understanding with Frankfurt Main Finance, the leading financial centre in the Eurozone. This partnership will undoubtedly reinforce the business cooperation between the Eurozone and Africa in the fields of green/sustainable finance and FinTech. In the upcoming weeks and months, Frankfurt and Casablanca will be implementing their joint plans and thus, strengthen their positions as leading financial centres. Casablanca Finance City (CFC) is an African financial and business hub located at the crossroad of continents. Recognized as the leading financial centre in Africa, and partner of the largest financial centres, CFC has built a strong and thriving community of members across four major categories: financial companies, regional headquarters of multinational companies, service providers and holding companies.